Research of Mongolian folk-religion has been the subject of special attention in recent years. Publication of extant texts and the translation, edition and analysis of these texts have appeared. We have got detailed descriptions of certain rituals, whole books have been dedicated to till now neglected areas. 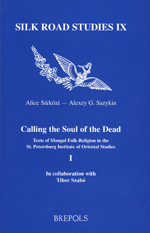 The present study examines a very special and less known ritual of folk-religion, the ceremony of calling back the soul of the dead or of the sick person. Among the Mongols and at the surrounding areas it was commonly believed that illness and death were caused by the absence of the soul, so a special ritual was required to call back the wandering soul.